I read about metaphorical graphic organizers in Kelly Gallagher’s thought provoking Deeper Reading. We have finally come to the end of The Call of the Wild and before the students respond to the novel with group discussions and Teaching Channels’ interactive stations, I handed them a recipe template for Buck. The students looked up their favorite recipes including lasagne, souffle and muffins. It seems we have some serious bakers in our midst. They noted cooking terms such as whisk, knead, mix, add, beat etc. They then referred to Buck’s attribute list: tenacious, survivor, confident, leader and defiant. Finally, the students listed Buck’s ingredients, wrote directions and put him in the oven. My French speaking student ended his recipe with ‘la cerise sur le gateau’. This activity demonstrated how well they understood the choices and decisions Buck had to make in order to survive. Rather than hand out rubrics for expected student behaviors, the students themselves create a list of habits that make a good class. Activity #1 Setting the tone of the class. A few years ago I came across a handout with an important purpose question: What makes a good class? (Unfortunately, I have no idea where I got this from). The students complete this from two perspectives: theirs and the teacher’s. In order to help the students clarify their ideas they list 3-5 things a teacher and student must be, say or do to create a safe environment for students to succeed. They worked in pairs and then in groups of four. One student from each group reported out. After listing the behaviors, we analyzed what habits a teacher and student share. This is the anchor paper that is strategically placed in my class. a tree with many branches that grow of the teacher. Activity #2 What the learners can expect to be doing in class. Although I am obliged to read through and discuss the course guidelines with the students, they are not engaged. However, I simplify a lesson plan created by Jim Burke which gets them thinking, generating questions and discussing. We look at the image of Wanderer Above the Sea of Fog by Caspar David Friedrich. The students note where he is, what he is doing, and the details/objects in the image. We then discuss how the wanderer reflects the beginning of their 9th grade journey; their hopes and fears. Activity #3 What is success? What does it look like? Does it matter? Each student drew the symbols of success on small whiteboards. Then they read (a jigsaw activity) an article on the habits of champions, identified the big ideas and created a slide show. Finally, as an exit note, they created a frozen statue of success. This was as far as I was willing to let them go. “It was a pleasure to burn”. That’s how Ray Bradbury opens his dystopian novel Fahrenheit 451. Ilana, our librarian, designed an interactive presentation to provide my ELLs with background knowledge to help them make sense of one of the central themes in Ray Bradbury’s Fahrenheit 451. She began by showing the students a powerful video. 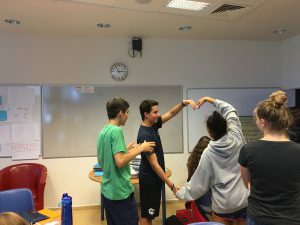 After a class discussion about the big ideas in the video, Ilana continued with the main activity. She had selected several books that had either been banned or challenged. On the table were strips of paper with the reasons for the challenge. Each student selected a few books and tried to match them with the reasons by reading the blurbs. The students were intrigued by the various reasons given for banning or challenging books. They were surprised that books they loved as kids such as Winnie the Poo, Where’s Waldo or Where the Wild Things Are, had been challenged. Banning Orwell’s 1984 made more sense. In the first follow up discussion, one student remarked that perhaps a government should control what people read in order to prevent them from getting strange ideas that might harm themselves and others. “What about Mein Kampf?” he asked. Our conversation moved on to freedom and personal safety. This discussion will be continued next week when Ilana reads a recently published children’s book that has been challenged. I am looking forward to the ‘ahah’ moments. The Argumentative Writing unit is well worth the purchase. To begin their writing journey, the students completed an enlarged version of the essay organizer. I conferenced with each one as they filled in the required sections of their research paper: thesis question, background information, evidence and analysis. This is one of the best ways to clear up confusions and think more deeply about their topic of inquiry.